Did Katy Perry Throw Shade On 'A Star Is Born' On Twitter? The other day, Katy Perry was minding her own business on Twitter when she decided to mosey on over to Twenty One Pilots' feed and casually like one of their tweets. But not just any tweet. A tweet encouraging fans to buy their new album Trench instead of the A Star Is Born Soundtrack, which it's competing with ~in the charts~. It seems pretty clear that this was an innocent like for the sake of LOLs, but now? Now Lady Gaga's fans are spiraling over what they consider pure shade. 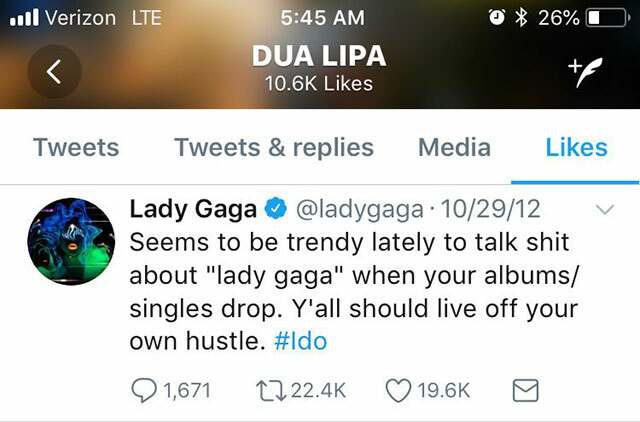 Meanwhile, Dua Lipa randomly decided to hop onto Instagram, find a Gaga tweet all the way from 2012, and pointedly like it. In conclusion, watch your likes.